With print volumes reaching as high as 4,000 pages per month, education service provider I CAN READ had been grappling with high printing costs for several years now. The company, which has about 150 employees in Singapore, has been conducting English literacy classes for young children and primary school pupils for the past 15 years. Until recently, it has been depending on leased printers to generate work-related reports in 24 enrichment centres located across the island. To rein in printing costs that had been increasing as its business grew, I CAN READ needed a more sustainable way to meet its printing needs. Kevin Zeng, regional operations manager at I CAN READ, says the company prefers printers that can offer a good balance between print quality and cost. “A key challenge we face is high printing costs, and if the printer is of a lower cost, the quality of printouts tends to be poor as well,” he says. After-sales service and repair lead time are important too, along with print speeds. “Lower print speeds can hinder us when we print in large quantities from time to time,” Zeng says. 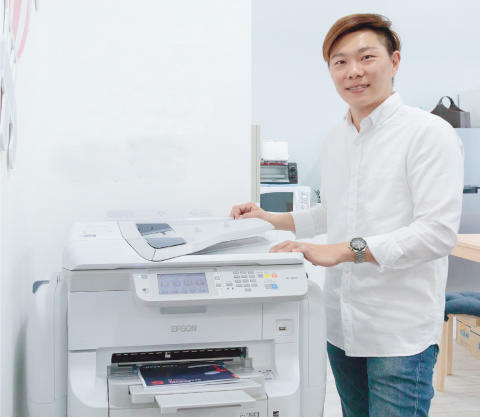 While at an Epson showroom, Zeng and his team tested the Epson WorkForce Pro WF-R8591, and decided to pick up the printer which features a Replaceable Ink Pack System (RIPS). RIPS technology has been proven to offer cost savings while enabling businesses to centralise their printing needs and maintain a lower inventory of consumables. Compared to traditional ink cartridges, RIPS uses high capacity ink packs that can hold a far higher volume of ink. This enables the Epson WF-R8591 to deliver a high page yield of up to 75,000 pages without having to replace the ink. The Epson WF-R8591 has been working out well so far. The printer is now being used for everyday printing – from drafts to final copies – by some 35 people at I CAN READ’s headquarters. More importantly, Zeng says the company’s colour printing costs are now lower than that of leased machines. “The cost of ownership is reasonable and the Epson WF-R8591 has been a dependable machine thus far. It also offers a good balance between cost and quality. With the lower cost per print and the good mileage we were getting from each ink pack, we were surprised that the print quality was suitable for our needs,” he says. Indeed, the high print quality was largely due to the use of Epson’s DURABrite Ultra ink and PrecisionCore printhead technology that offers a print resolution of up to 4,800 x 1,200 dpi. No warm-up time is needed, and the first page can be generated in under seven seconds. Zeng is satisfied with the Epson WF-R8591’s print speeds as well. The printer has been able to deliver default print speeds of up to 24ipm and draft print speeds of up to 34ppm for both black and colour prints. To meet the needs of growing businesses like I CAN READ, the Epson WF-R8591 can be upgraded with additional paper cassettes to support up higher input capacities of over 1,800 sheets. Paper of different sizes can be placed in different cassettes for automatic selection. A single sheet priority tray is also available for manual feeding of templates such as letter heads, in addition to a rear tray that supports the use of special media such as photo media. Zeng says the Epson WF-R8591 is simple to use too, as his colleagues could easily figure out the user interface after a few tries. 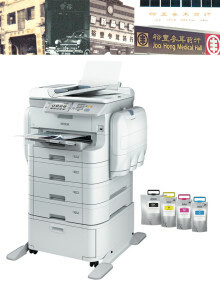 The printer is also equipped with a range of connectivity options such as Ethernet, Wi-Fi, RJ-11 fax, plus Wi-Fi Direct that lets up to four devices connect to the printer simultaneously. In summing up the business impact of the Epson WF-R8591 so far, Zeng says: “With the additional Epson printer, we have definitely increased productivity. Our HQ colleagues no longer need to share one main printer especially when we are doing large quantity printouts. We are now looking to equip our larger enrichment centres with the WF-R8591 once the lease of the current printers expires”. I CAN READ was looking to replace its leased printers with a printer that could deliver good quality printouts at a low running cost. It has to generate high volume printouts quickly too, as any delays would hamper productivity. The Epson WorkForce Pro WF-R8591 delivers high page yields of up to 75,000 pages, uninterrupted printing in both black and colour, along with professional output quality at high printing speeds.